In the national final in Greece there have been four finalists with quite strong songs. The winner was the most youthful and contemporary entry “Rise up” by Freaky Fortune feat. Risky Kidd. It’s great to see that even if there are difficulties Greece is still eager to participate in the ESC with a lot of positive energy and enthusiasm. The result is remarkable, since 2004 Greece has always qualified for the Grand Final, this is maybe mainly due to the Diaspora voting but also due to the contemporary music taste the Greeks are showing. The duo Freaky Fortune consists of Nikolas Raptakis and Theofilos Pouzbouris, both born in 1990 in Athens. Both studies music since their early years, while Nikolas takes lessons in composing, Theofilos has been studying music history, guitar and piano. The duo Freaky Fortune became popular in the internet community with a cover of the Perez Hilton’s cover competition. By now they had big radio hits with "Our Destiny", "Stronger" and "All I need”. Risky Kidd, whose real name is Shane Schuller, is a 19 years old rapper who is born and raised in London, he has a German father and a Jamaican mother. He grew up in a very multicultural environment and enjoyed the most different music influences. Since Shane’s school years his into music, rap and lyrics. His biggest success was the cooperation with Playment and Helena Paparizou in the international hit “All time”. 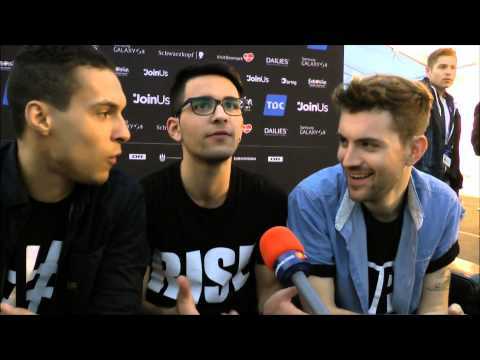 The song “Rise Up” is nothing we would expect from a Greek entry. This is a very modern tune with a strong rhythm and a very forcibly chorus. The beginning of the song sounds like an old movie soundtrack. This is an entry of the 2014 generation of Athens, a youthful techno song with a global message “Rise Up”, no matter what happens, never giving up, dance and think positive with a lot of energy. Nikolas and Theofilos composed the song and Risky Kid was responsible for the rap part. With this kind of music the youth of Europe should be targeted. A positive message and cool guys do stand for a new understanding. This should definitely be in the Grand Final. For the 35th time Greece is participating in the Eurovision Song Contest. Compared to the other Western European countries Greece had its debut quite late in 1974. The first Greek entry in Brighton was “Krassi, Thalassa Ke T'agori Mou” by Marinella and came 11th. Greece has won the ESC for the first time in 2005 with “My number one” by Helena Paparizou in 2005. This was a truly well deserved victory after many unfair low placements. Greece is one of the countries which take a great advantage of the televoting, in former years the Greek entries have not been highly awarded with points from the juries. Thanks to televoting Greece always made it into the grand final. The only country to favour Greece with 12 points on a regular basis is Cyprus. Therefore Greece never had zero points in history! Over the years the Greek entries have become very contemporary and do not hide their traditional folkloristic roots. Greece always made it into the Grand Finals, while other countries struggle. The most outstanding Greek entries were “I Anixi” by Sofia Vossou in 1991 (13th), “Die for you” by Antique in 2001 (3rd) and “Everything” by Anna Vissi in 2006 (9th).